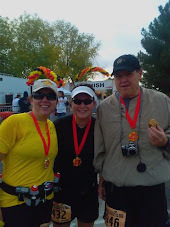 Yesterday was the 2008 Fiesta Bowl Half Marathon up in Scottsdale. It's a much smaller race than what I'm used to (yes, I purposely drown myself in larger races where no one notices if you come in last) and it had never really been on my "to do list". My focus lately has been solely on the RNR Half Marathon coming up in January. Yet two of my fellow TRC runners - Pat and Christina - were running this race and we had chatted about it on several of our long runs. For Christina, this was her very first race EVER.....and she was faced with having to run it alone :( After a lot of mental struggles, last week before I left town, I committed to running this race with her (strictly as a training run for me as funny enough I had 13 miles on the schedule for this weekend) and got myself all registered and ready to go. The goal was completion....and to give Christina some company as she crossed the finish line for the very first time. Mentally, I knew I wasn't really ready for this ~ but for once I jumped out of my comfort zone and decided to give it the good ol' college try. My past half marathons have left me with a lot of mental baggage and trepidation....but it was time to face the pavement once again. The goals are always the same. And yesterday, after a good solid run, I met each and every one of them! The weather was perfect (although quite chilly at the start), the company was great, and very methodically Christina and I covered the distance. We ran ~ did not walk~ together for 11 1/2 miles ~ solid and strong. At that point, I felt my legs tighten and my mental paranoia started to take over a bit. I knew it was time to walk some, and slow the pace even more and take it on in. So after 11 1/2 miles I sent Christina packin' :) as she was well on her way to a fabulous race of her own, and we each needed to do what we each needed to do for our own success. It's hard not for me to "what if" this race to death, like I have with all the others. Of course, we were on track for a much better finish time (after 10 miles, my mental math showed that we could have made it in around 2:40.....which would have been amazing!) and I start to wonder if I let all the mental stuff really bog me down. In the past, my issues have been physical; yesterday, I think it was more mental. I also discovered that I can RUN a long distance. It's slow, of course ~ our pace averaged anywhere between 12 mpm and 12:30ish ~ but we didn't stop. This is one area that running with Christina has really helped me in reducing my reliance on walk breaks. I'm still not sure what works better, time wise ~ running a bit faster and incorporating walk breaks, or just running slow and steady all the way through. Yesterday it was slow and steady, and it worked for us. Yet another new accomplishment for me! Garmie has my total mileage at 13.27, so I guess that makes me an over-achiever :) I hate it when I have to run more than required!!!! And since Garmie time and chip time agree, I think I should get credit for a marginally faster pace :) When you're this slow, every second counts ya know!!!! But for the first time in my running career, I'm happy with my performance. Yes, it was a PR by about 5 minutes off of my Valley of the Sun HM from March. Yes, that makes me super happy. However, I also know that I can do better. I know that a 2:40ish finish was well within my reach...I just somehow chose not to grab it. Now I just have to get my mental game on and really start pushing myself toward what I know I can do. And congrats to my buddy Christina who finished her first Half Mary yesterday (in about 2:43ish, I think....freaking awesome!) and thanks to my buddy Pat who is always a fountain of moral support. We couldn't have asked for a better day to run! You both looked great at the finish. I think next months HM will be great for you. You rocked it!!!! Congratulations!!! Awesome job!! Nice job on the half marathon! I think you did great! Woo hoo! A PR on a race that is essentially a dress rehearsal for next month? You rock! Hope you can relax and enjoy the holidays now. Congrats on the PR. And on sticking to it. You've become my inspiration. A PR with no training, and meeting all your goals sounds just like an AWESOME half marathon to me! Well done!! Great job with the race! Getting a PR with the week you had leading up to it is pretty awesome. It was great seeing all of you out there. I'm sure I'll see you at some other races in 2009. Instead of ME actually running, can I just pretend that I'm you? Then I wouldn't have to actually run, but I could tell everybody what a fabulous runner I am - really nobody would ever find out...can we do that? pleeeze? kthx!! Great job Pokey!!! I am so happy for you. You are going to do awesome next month at RnR. Great job !!! Hat off to you for getting the job done at Fiesta Bowl. Great post race report. I have to agree that nutrition and hydration plays an important role in running a race. I will look forward to your on going progress toward RNR Half Marathon next month. Congrats on your race! Way to support your friend, Christina! This helps get me fired up for my half-marathon in late January. Great job on the half marathon and a PR! 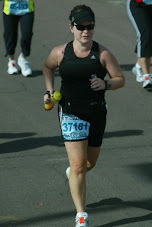 congratulations to Christina as well who completed her first half marathon! I can't wait till I am able to run my first half marathon! That's a fantastic picture of all of you! You did GREAT and should be so proud of you. I can relate to you so well about the running and the love/hate relationship part. I'm glad you did it and feel good about it! Congrats on another half, and one you're happy with at that! With this one being so close to home, it may be one to look at for next year - I hadn't heard anything about it. Hopefully you can demolish the RNR half, since that's been the focus of your training. Maybe I'll be able to see you there, it looks like we're about the same pace! Hooray on the PR! Woot! Woot! WOW! Awesome! You are such an inspiration. I can't imagine running the whole time. I'm such a walk break gal. Perhaps I'll have to try that next year. And thank you for your comment the other day on my blog. I really appreciate it. I may throw out my scale, afterall. We'll see! WOOT WOOT that's fantastic Pokey. I am so proud of your PR...own that, you earned it. You have come a long way with your running. I am proud of you. Best of luck on 2009. Nice job and nice consistent splits! Congratulations. I want the book when you are done with it. Way to go, Pokester. A great time. Even those walking miles were barely slower than the running miles. Congrats Poke, what a sweet pace. I hope I can run Surf in that time if I am running, if not we will have a blast anywhoo! I got so tired of trying to find ways for healthy living, I’m so thankful that I was able to see this site, wow it made me speechless, they have almost what I needed, like alternative health, neurofeedback, holistic healing, alternative natural healing and dynamic psychotherapy. Got to see this guys, it is really a big help for me.